Nothing says summer like a sampling of Chicago craft beers on a sun-kissed evening. And, in fact, as home to over 65 neighborhood breweries and counting, the city is applauded as an innovator on the national craft brewing scene. Which is likely why everybody’s so excited about the second season of Chicago Friday Night Flights, launched with huge success by the Illinois Craft Brewers Guild in partnership with Choose Chicago just last year. 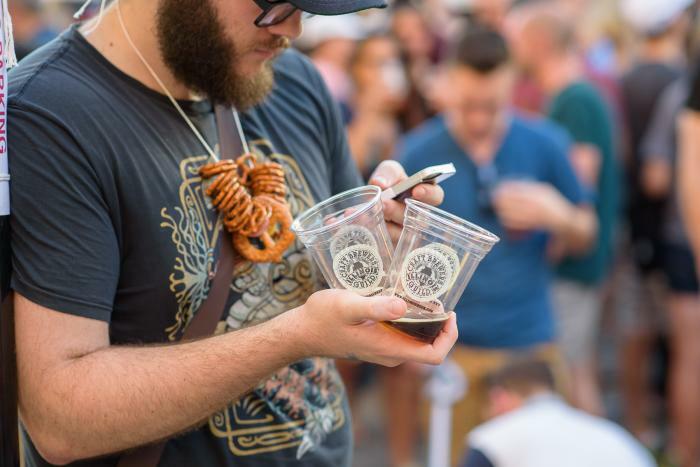 Beginning June 15 and extending through September 14, you can taste the best of Chicago’s burgeoning brewery industry at neighborhood-centered events, drinking in the city’s most vibrant districts and venues. Spend your Fridays from 6-9pm sampling 10 3-oz pours for just $15 when you pre-purchase tickets (or $20 at the door). Great food and live music round out the evening. Over 25 Chicago breweries will be featured at Lakeview&apos;s Gallagher Way, a picturesque open-air gathering place next to historic Wrigley Field. Chicago favorites Smoke Daddy and Big Star, part of recently opened Hotel Zachary at Gallagher Way, will offer their signature BBQ and gourmet tacos to pair with a variety of craft beers drawn from neighborhoods across the city. Oh, and by the way, the Chicago Cubs go head to head with the LA Dodgers at Wrigley Field on Monday, June 18. It’s the perfect excuse to make it a long, craft-beer-and-baseball weekend. Milwaukee Avenue crosses the historic northwest neighborhoods of West Town, Wicker Park, Bucktown, Logan Square, Avondale and Portage Park – neighborhoods that have become synonymous with hip, progressive and creative venues and events, not to mention some of the best beer in the country. Held in the heart of the Logan Square Boulevards Historic District, this event will highlight the beer mastery of Aleman Brewing, Lake Effects Brewery, Pipeworks, Revolution Brewing, Hopewell Brewing, Piece Brewery, Maplewood Brewery & Distillery, Off Color Brewing, Forbidden Root Brewery (the city’s botanical brewery) and Metropolitan Brewing. While you’re there, watch the sun set in Logan Square Park, anchored by the iconic Illinois Centennial Memorial Column. The 70-foot (21m) marble Doric column was built in 1918 to commemorate the State of Illinois’ 100th anniversary, and was designed by Henry Bacon, famed architect of the Lincoln Memorial in Washington, DC. The Chicago Friday Night Flights party heads to the beach in July, with all the instagrammable Lake Michigan and city skyline views you could possibly wish for. 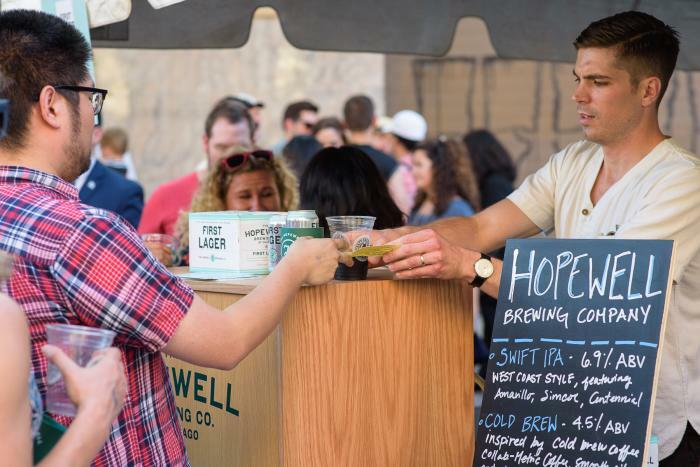 Breweries from the South Loop, Bronzeville, Pilsen, Bridgeport, Pullman and Beverly will pour their best creations, while lakefront-sited Pier 31 serves up food and music. Participating breweries include Open Outcry Brewing, Whiner Beer Company, Horse Thief Hollow, Vice District Brewing, Marz Community Brewing, Lagunitas, Motor Row Brewing, Lo Rez Brewing, Alulu Brewery, Argus Brewery and Baderbrau. Adding even more hype, Band of Bohemia, America’s only Michelin-starred brewpub, will serve up its inspired, award-winning cuisine. You’ll find yourself in the heart of Chicago’s trendsetting restaurant, nightlife and gallery scene when you venture to the West Loop & Loop’s Chicago Friday Night Flights event. Participating breweries include Goose Island Beer Company, Great Central Brewing, Finch Beer Company, Haymarket Brewery, Rock Bottom Brewery, On Tour Brewing, Illuminated Brew Works, Cruz Blanca Cerveceria, All Rise Brewing Company, Eataly’s Birreria and Gino’s East (yep, they’re about more than just pizza!). While you’re there, take a wander to the Hubbard Street Murals, (1030-1044 W Hubbard St), which were originally painted in the 70s, with the involvement of more than 500 artists over an 8-year span. The mural restoration project is ongoing, thanks to the expertise of an army of volunteers. What that means for you is a ton of like-worthy Instagram moments. What better venue for award-winning craft beer than the multi-award-winning 1.25 mile Chicago Riverwalk, which most recently received a 2017–2018 Global Award for Excellence from the Urban Land Institute, competing with projects across North America, Asia, and Europe. This scenic promenade and urban recreation waterfront park will host over 15 breweries from across the city – all against the backdrop of Chicago’s iconic skyline and the Chicago River’s calm waters. Before heading into the closing night events, board the Chicago Architecture Foundation Center River Cruise Aboard Chicago’s First Lady, voted the #1 tour in Chicago and one of the top 10 tours in the country by TripAdvisor. The 90-minute cruise is narrated by CAC-certified docents, who point out more than 50 architectural sights, and give insight into the design giants who shaped the city’s world-famous skyline. Check out the schedule here.